This is a word game to learn and practise the alphabet and various vocabulary. It can be played individually, in pairs or small teams. 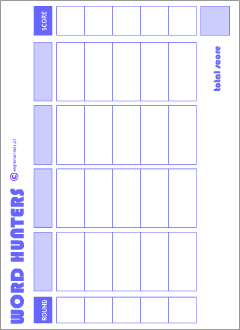 Print out a game grid and cards. If you want, you can stick the printout onto the heavy paper. Laminate for future use. Give each student a copy of the game sheet. Choose five question categories, for example, Animals, Colours, Toys etc. Shuffle and spread all the ABC cards out face down on the table between the players. Select a letter at random. Now your students must, as fast as they can, fill the categoties with words beginning with this letter. The one that finishes first counts: 5, 4, 3, 2, 1, then shouts: Stop! Also, you can use the playing cards to play different games such as memory, matching or guessing games. For some ideas, check out our 22 Flashcards Games handbook (pdf). To play our word games. But you can just use a piece of paper. 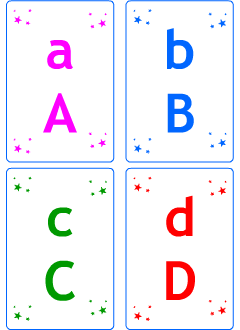 A set of ABC cards to play different language games. Ideas for classroom games. You can adapt them to any language concept.